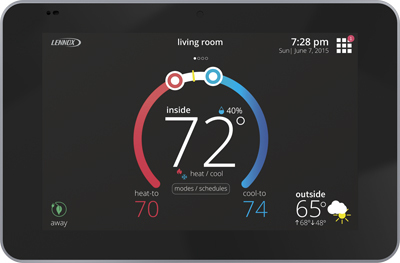 With a conventional programmable thermostat, you have to set your schedule based on what you think it will be. There's not much room for flexibility or change. The iComfort S30's Smart Away Mode™ uses the GPS locator on your mobile phone to detect when you come and go, adjusting temperatures accordingly, so you can get energy savings with out even thinking about it. Schedule IQ™ Technology works with Smart Away Mode to help optimize heating and cooling based on the patterns of your family's routine, including wake and sleep times. The iComfort S30's Feels Like™ Temperature is similar to the "Feels Like" temperature in a weather report. It takes into account the temperature and humidity to help make your home feel exactly like you want it. Allergy Relief Exactly When It's Needed. The iComfort S30's Allergen Defender monitors the air quality and pollen levels of your local zip code and automatically turns the fan on to clean your home's air when outdoor levels are high. The iComfort S30's Advanced Warnings can predict some problems before they even happen. The iComfort S30 can alert you to issues early on, before they interrupt your comfort. *Only when paired with Lennox premium equipment. Lennox Signature Collection & Lennox Elite Collection.